Current, either wind-induced or natural, is one of the greatest aids to the musky hunter yet one of the least understood. 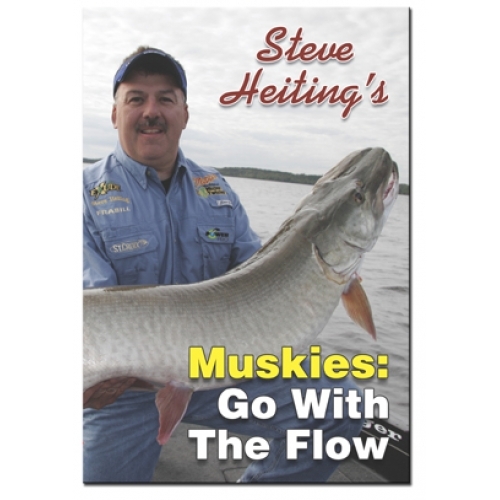 In this, his fourth instructional DVD, Steve Heiting explains how to use water flow to your advantage to catch more and bigger muskies. Three years in the making and professionally-edited, this DVD contains terrific musky fight footage that punctuates each of the points Steve makes. Sit back, and hold on to your remote! • Muskies In Current: Steve explains how he fishes in wind and natural current and where he expects muskies to be found in these situations. • River Muskies: Rivers tend to be enormously overlooked but can yield fantastic fishing, especially as muskies gain a foothold in the rivers of the Midwest. • Boat Control: Steve explains how to rig your boat to use current and how to make the most of each cast. • Special Circumstances: Wind or current may create tremendous opportunities where you least expect them. • Pre-Turnover Binge: Everywhere they’re found, muskies move shallow before turnover in early fall. Target them, and you’ll catch giants! • Also: Musky tips and hilarious outtakes.